Anthrax is a bacterial infection caused by the organism Bacillus anthracis. It can be found in grass-eating wild and domestic animals, such as cows and sheep, most often in the agricultural regions of Asia, Africa, South America and parts of Europe (southern and eastern). The bacterium forms spores that can survive and lay dormant in the environment, for example, in the soil. These spores need a suitable environment to germinate and cause anthrax infection. This environment may be in the skin, lungs or the intestine. Anthrax spores have also been used as a biological weapon by terrorists who have found ways to release the spores unexpectedly, so exposing people to the infection. There are three different types of anthrax. Cutaneous Anthrax - this type accounts for about 95 per cent of cases. People handling dead animals - such as abattoir workers and tanners - are at most risk. Infection occurs when the bacterium comes into direct contact with a cut or abrasion in the skin. At first the skin itches. This is soon followed by the appearance of a small, raised itchy bump that looks like an insect bite. This skin lesion is commonly located on the head, forearms or hands. Within one to two days the skin lesion develops into a vesicle and becomes a painless ulcer, usually about 1cm to 3cm in diameter. After two to six days the black dying central area of the ulcer that's characteristic of cutaneous anthrax is apparent. If left untreated, cutaneous anthrax infection can spread and cause blood poisoning, which is fatal in up to 20 per cent of cases, but with effective antibiotic treatment few deaths occur. Inhalational Anthrax - when inhaled, the larger spores lodge in the windpipe or throat, while smaller ones lodge further down the respiratory tract in the lungs. The anthrax bacteria produce toxins that enter the bloodstream and cause haemorrhaging and tissue decay. Initial symptoms of inhalational anthrax, which is rare, are mild and non-specific, similar to the symptoms of a flu-like infection. These include tiredness, weakness, fever, mild non-productive cough and chest pain. If left untreated, over the next two to six days this mild phase becomes severe, causing breathing problems, sepsis and bleeding. By the time the infection has reached this stage it's usually fatal. Intestinal Anthrax - a very rare form of food poisoning that may follow the ingestion of contaminated meat. Initial symptoms are nausea, vomiting, loss of appetite and fever. As the infection becomes more severe, abdominal pain, vomiting of blood and severe diarrhoea occur. 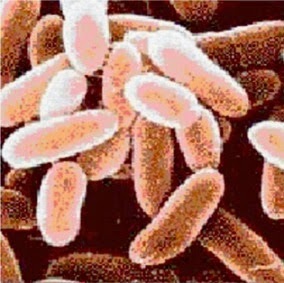 Intestinal anthrax is often fatal. Anthrax is uncommon in the UK and only a handful of cases have occurred over the past ten years. Anthrax infection can be treated successfully when the disease is identified early on. Treatment is with a course of antibiotics. It isn't necessary to quarantine patients with confirmed anthrax because it's extremely unusual for anthrax to be transmitted from person to person once treatment has started. However those working with anthrax in a laboratory for example, do need to follow strict Biohazard guidelines to protect themselves from the risk of infection. If a person is exposed to anthrax, or is at risk because of their job for example, there are preventative steps which can be taken. There is a vaccine against anthrax although this is not widely available. Antibiotics can also be given to prevent anthrax from developing.